When we arrived at the Hotel the receptionist offered us an upgrade, for a price, which included free WiFi and use of the executive lounge from 7am to 10pm daily. This included continental breakfast from 7am to 10am, tea & coffee & a selection of fruits & snacks throughout the day, & happy hour from 6pm to 8pm with selected alcohol beverages & hot & cold bites. We enjoyed using the the lounge. Our room was spacious, with a fantastic view over the Creek, & well equipped, with a safe, tea & coffee facilities, etc. plus & iron & ironing board. We enjoyed our stay very much. Should we return to Dubai we would definitely consider staying there again. The pool area is small, with a limited number of sunbeds, but fantastic views. The sister hotel on the beach is a long way away & very very busy. The staff were excellent, Jannine on reception, Colleen in the lounge, all the staff in the lobby area & the housekeeping staff. 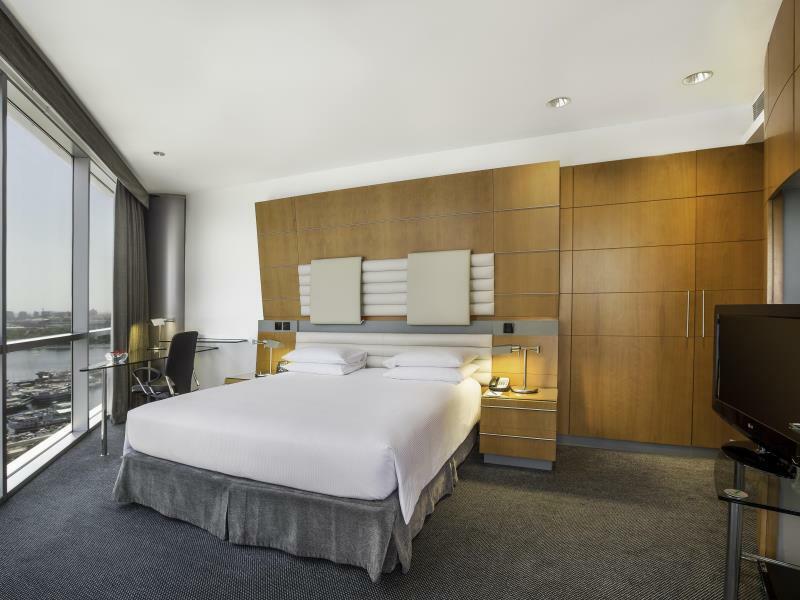 Handy for the airport, good staff on the desks and door, not too badly priced, this hotel was good for a 2 night stopover. It made a pleasant change to have quiet and effective a/c. 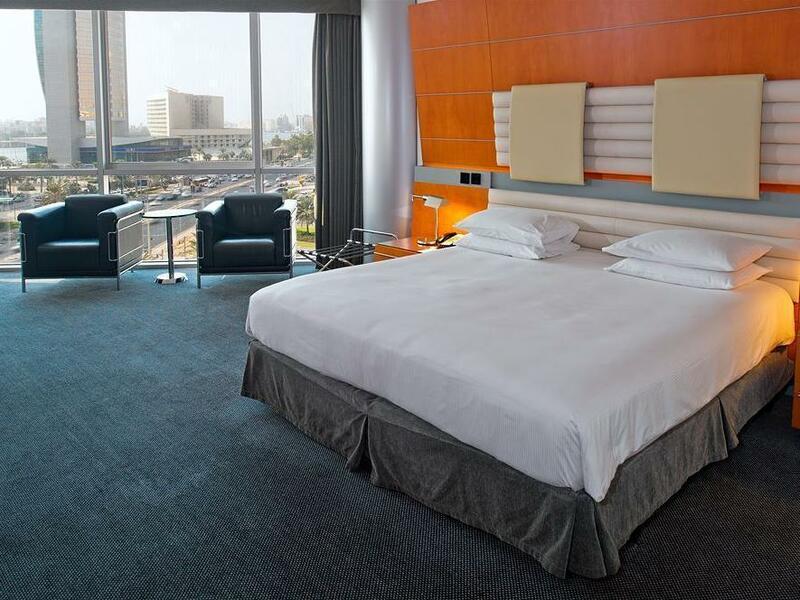 If you run to about £50 or AED230, it is worth upping your room to exec.. It gives a civilised setting for breakfast and 6-8 pm is happy hour which includes snacks substantial enough to call dinner - thus cutting the need for restaurants and the too-rich food they always provide. There's a free bar during happy hour. Quick check in/out, Friendly reception staff, overall relaxed atmosphere. We stayed at the Hilton Dubai Creek for two nights and it was a very pleasant experience. Checked in as a couple and the staff was very courteous, the rooms and linen were clean. Will definitely recommend to frends & family. I was at this same hotel last year for a Dubai stopover and I came back as I was satisfied. On arrival, I was offered a full package upgrade and I took it. 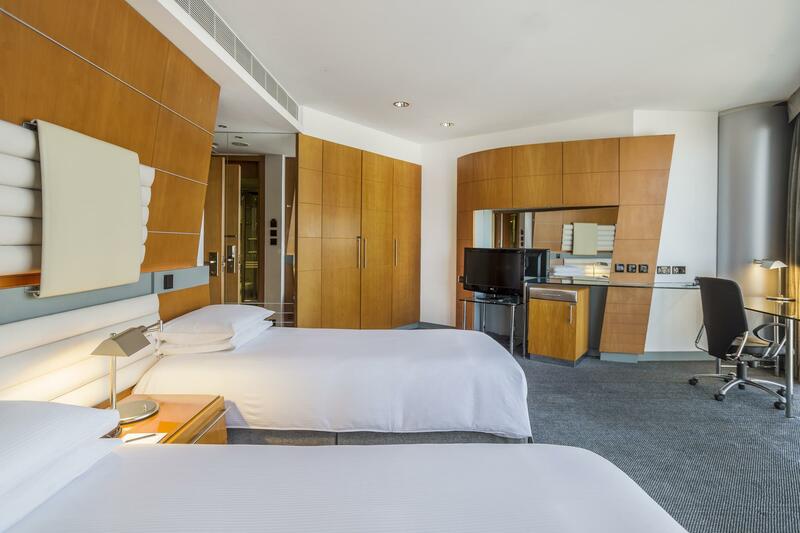 It included an upgrade to a corner room with a full view of the Dubai Creek, breakfast for the 2 days for 2 people, and access to the Exec Lounge including the happy hour. The gentleman at the reception pitched in a late check-out at 4:00 pm and use of the exec lounge including the happy hour the day I would be leaving as I was too late the day of arrival to make use of it (checked in at 9:00 pm. when I checked back on the day of departure, neither the late check out or access to the exec lounge were on the system. I was offered a late checkout at 2:00 instead and no further use of the exec lounge. When I showed frustration, I was asked who had told me about the benefits I was not getting further upsetting me because it sounded like they were insinuating I was lying and then I know that they can tell who checked me in in the system. This is typical of Dubai and the Gulf, a phenomenon that I call 'cheap talk' service, where people try to be pleasant in a conversation by offering things they do not fulfill later on. I have to stay that the room was well worth it. The breakfast was correct and staff quite friendly. The hotel is greatly located near a mosque, a bank, a supermarket and a couple of restaurants. The finger food served at the happy hour in the exec lounge was great. My other negative take on the hotel is the Internet which is not included in the room rate and charged quite heftily if you decide to take it(about $30 per day if I am not mistaken). I used it on the exec lounge during the happy hours but still felt restricted. The least they could do with an upgrade is to include the Internet. I don't know of many hotels that still do not include Internet in their base price anymore. The second is the gym/spa facilities that are non-existent. Only a pool is on offer though I did not use it. 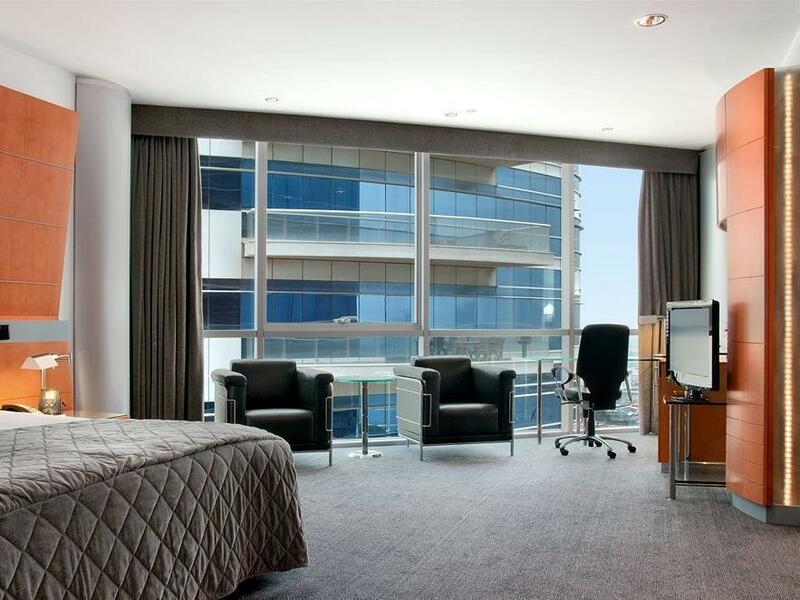 Free shuttle bus to the beach (Hilton Jumeira), Executive floor (love it), great room and bed. Our third stay at the Hilton in Dubai was great as before. We were there in September, it is very hot and the pool is fantastic. I enjoyed 2 hours every day of free drinks and snacks for executive rooms. My only complain would be the internet. There is no free wifi in the room, you have to pay for it. I have been travelling around the world and hardly anywhere is paid wifi. But still, I will be back. Emirates is a great airline and stop in Dubai is great. It was a nice relaxing stay. Staff was really polite and helpful. It is about 20-25 mins away from the all the main attractions/malls of Dubai. Taxis were easily available which would charge anything between $10-$20 to get you to your destination. The only downside was that wifi was only available for free in the lobby. To get it in the room there was a charge of $27 per day. Did not use their dining options. Swimming pool was small but on the roof top, so had some nice views of the city. Close to local shops which you can explore at night. Nice room. The breakfast has the same option everyday we feel a bit boring. Nice location, easy to reach other places. Nice size, good location and close to DXB! The hotel is near the airport. It is one of the best when it comes to room comfort. The staff is very helpful as well. Although I paid a little more than planned, I get my money's worth as it is one of the most comfortable hotel. 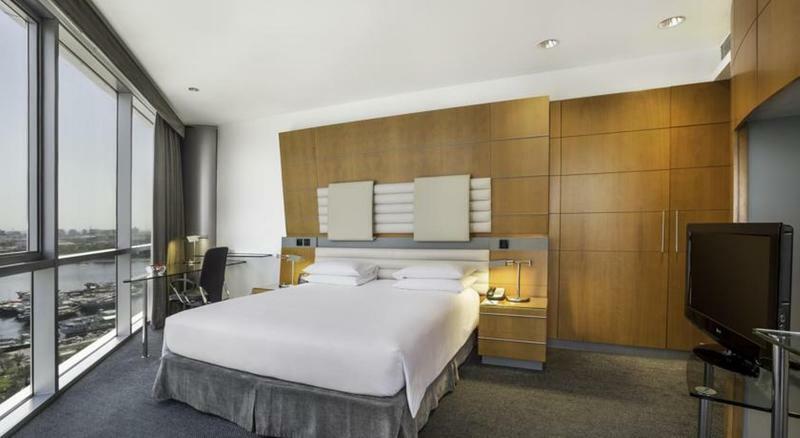 The hotel is conveniently and attractively located. Rooms are large. Short and sweet stay, extremely comfortable. Not much around in terms of location but close to the airport. สถานีรถไฟใต้ดิน Al Rigga - ระยะ 0.74 กม.